Fridge Filterz FFMT-315-2 cyst filter (Standard 42 & 53) 2 Pack replacement water filter is designed to fit selected Whirlpool*, KitchenAid*, Maytag*, Amana*, Jenn-Air* & Kenmore* refrigerators. This premium water filter is designed to remove fine sediment, Chlorine Taste and Odour as well as contaminants and heavy metals including Lead, Mercury, Lindane, 2-4-D, atrazine and benzene, to name a few, that may be present in your drinking water. This refrigerator filter replaces: Whirlpool*, KitchenAid*, Maytag*, Amana*, Jenn-Air* using Filter UKF8001 or UKF8001AXX, KitchenAid* Filter - Kenmore* Filter 46-9006, 9006, 469006. The FFMT-315-2 is tested to meet NSF/ANSI Standard 42 & 53, Particulate Class I, to ensure that you are getting a SAFE, quality product. Fridge Filterz are manufactured to the highest quality standard, providing you and your family with clean, odour free ice and water without removing beneficial minerals and fluoride that may be present in your drinking water. Frigidaire PureAir Ultra. Refrigerator Air Filter is a proprietary replacement part for Frigidaire. refrigerators. The PureAir Ultra. Refrigerator Air Filter eliminates foul odors from your refrigerator and freezer by trapping, neutralizing and removing odor-causing molecules. Replace every 6 months. 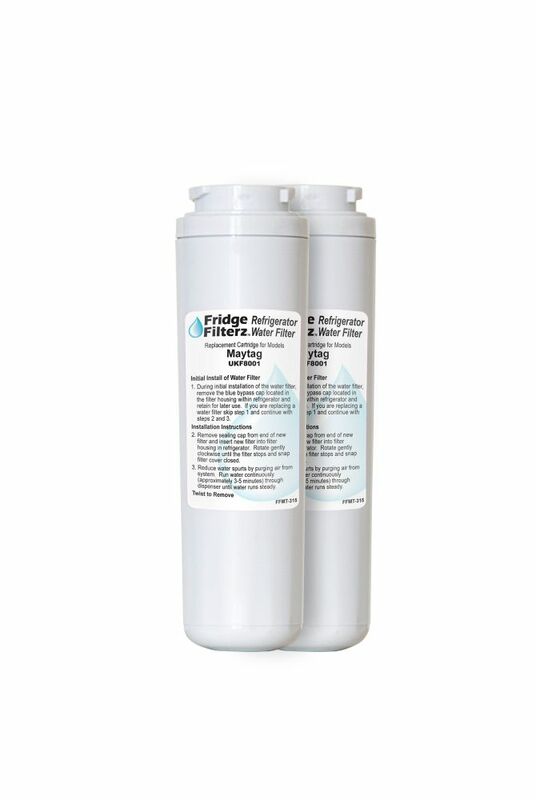 Refrigerator Water & Ice Filter for Maytag UKF8001, Amana, KitchenAid (2-Pack) Fridge Filterz FFMT-315-2 cyst filter (Standard 42 & 53) 2 Pack replacement water filter is designed to fit selected Whirlpool*, KitchenAid*, Maytag*, Amana*, Jenn-Air* & Kenmore* refrigerators. This premium water filter is designed to remove fine sediment, Chlorine Taste and Odour as well as contaminants and heavy metals including Lead, Mercury, Lindane, 2-4-D, atrazine and benzene, to name a few, that may be present in your drinking water. This refrigerator filter replaces: Whirlpool*, KitchenAid*, Maytag*, Amana*, Jenn-Air* using Filter UKF8001 or UKF8001AXX, KitchenAid* Filter - Kenmore* Filter 46-9006, 9006, 469006. The FFMT-315-2 is tested to meet NSF/ANSI Standard 42 & 53, Particulate Class I, to ensure that you are getting a SAFE, quality product. Fridge Filterz are manufactured to the highest quality standard, providing you and your family with clean, odour free ice and water without removing beneficial minerals and fluoride that may be present in your drinking water. Refrigerator Water & Ice Filter for Maytag UKF8001, Amana, KitchenAid (2-Pack) is rated 3.5 out of 5 by 15. Rated 3 out of 5 by Gd66 from Inconsistent One out of the two filters usually doesn't work well. Exactly the same problem I had with the last set I purchased. Low flow rate out of one filter and the other one works great. Rated 1 out of 5 by Stoochie from Extremely slow I bought this product about 2 months ago. we are very unhappy with it because the flow rate is probably half of our old filter. It's almost painful standing there trying to fill the reservoir for our coffee maker. I would not purchase this product again. Rated 4 out of 5 by Sydney 18 from UKF8001 Fridge Filter I bought this product about 2 months ago and I am so happy. Rated 5 out of 5 by Jonesi77 from Works great This is my 3rd purchase of this filter. If you flush it properly it will give long life if not it will fail not long after install. Follow all directions carefully. I had to open door of fridge to listen and make sure flushing was complete. Rated 5 out of 5 by Jean from Great buy Works great with our Kitchen aid fridge! Make sure to flush it though! I was abit worried to see black water for a while at the beginning. However, after about a litre, it ran clear and it was clear after. Rated 2 out of 5 by Terry from Fridge Filterz Maytag UKF8001 Replacement water fi Two factors helped me make the decision to buy this fridge filter. It was half the price of the original Maytag UKF8001 filter I was using (made by 3M), and it passed two water filter ratings like the 3M filter. However, the flow rate is slow and more like the 3M flow rate when it needed replacement. The filter did remove the chlorine taste but the water didn't taste as 'sweet' as when using the original Maytag UKF 8001. In what country are these filters made? The carbon blocks are made in USA, the filters are assembled in China. In order to control and guarantee the quality of the filter and the filtering process Fridge Filterz has the filter blocks made in USA to meet ANSI/ NSF standard 42 and 53.